The past few years, my stake has put on a Christmas Interfaith Celebration. The problem is this: it is not really interfaith at all because only Mormons come. Sure, I live in Utah County, home of the highest concentration of Mormons anywhere, and frankly, the few non-Mormon churches that are here meet in strip malls. In my ward of 2 subdivisions, only 1 family is not Mormon. (I’m not kidding.) We have our share of inactives, but it is really a Mormon monopoly. This year, they decided to drop the “Interfaith” and call it just simply a Mormon Christmas celebration. We had a few tents outside the stake center with nativity scenes from all over the world. We even had a real, live camel! I’ve often complained about the poor Christmas services Mormon generally have, but it was nice that our stake put some effort into it. We had an orchestra, French horns, choirs, and lots of musical numbers. Have you had, or are you planning some better Christmas services this year? Next Next post: What Isn’t Church Abuse? It’s pretty cool and well attended. This has been a general complaint I have had for years. The church (for whatever reason) does not like to focus on holidays such as Easter or Christmas. I have long felt that the week before Christmas, not only should sacrament be devoted to the birth of the Christ but the other meetings as well. We should really put the focus on The Savior.In addition, we should have other things such as you mention,such as nativity,etc. Aside from the ward Christmas party and the Sunday services before Christmas, nothing “special” is done. Additionally, the church is never decorated–not a single poinsettia or green bough, nativity is anywhere to be seen. Walk into the chapel–burlap walls, blue carpet and benches, dim lighting. Depressing. I was particularly embarrassed on Easter one year when investigators came, no decorations–and it was Fast Sunday with the typical, “I know this church is true” testimonies. On the other hand, my Catholic and Methodist neighbors consistently attended church services on Christmas eve. This stake (in Kansas) has an orchestra, multiple choirs, has sign language translators for everything, a live nativity, and invites bell choirs and other non-LDS musical performers. They also set out hundreds of nativity sets. There is a ward in McLean Virginia that for years decorated the chapel. Poiensettas. Greenery. Unlit candles. Gorgeous. Uplifting. Appropriate. I wonder if some upper echelon person put a stop to it. Our stake far from the center place has hosted a real interfaith choir festival for fourteen straight years, the first Saturday in December. This year, we had 10 choirs, including one LDS. The stake center fills to capacity. Our building is beautifully decorated, with wreaths and poinsettias in the chapel and a garland of green run all around the cultural hall. We have a Christmas tree in each foyer, and they both have white lights (don’t tell anyone!). And three trees outside have white lights that automatically come on at dusk. 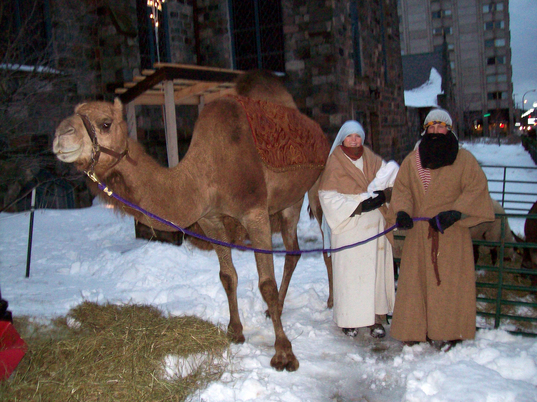 Winnipeg Canada puts on a Live Nativity at a well known tourist spot here, gets lots of people! Also for several years now we partner with a local Catholic Church to have a communal hymn sing and people from both Churches sing Christmas songs. Always well attended. Some people really like it! I was part of a Community Chorus/Orchestra that presents selections from Handel’s Messiah at Christmas/Easter. A few years ago they were in need of a location for a concert and I volunteered the Stake ctr. It was scheduled for a Friday night, and having a local high-school choir as an opening act guaranteed some visitors. Missionaries got permission to serve as ushers, and it was the best attended of six concerts we did. I’m sure glad the Stake Presidency approved it in time. After I moved away from Cedar Rapids they started an interfaith christmas nativity display. I think it would be cool to have a christmas mass on the 24th; but i can just imagine all of the people howling about it now. No one would want to be in charge, etc. I wish I lived in a big city so I could go to other church’s for their christmas/easter celebrations. A stake in California has a full week event, they have a rooms full of nativities, the whole building is redecorated for the season. They have choirs from all over the area. Some LDS others from local schools and other churches. Its impressive to visit. It would be nice if as a church we could come up with more like that. We make our kids go to a midnight mass every other Christmas Eve because our ward doesn’t believe in Christmas programs (or something). We actually suggested a Christmas Eve service this year as a Ward Activity and were shot down. At least next year Christmas is on a Sunday – which will probably just mean a 1/2 hour sacrament service and can the rest of the program. My stake is the one that does the Creche exhibit that cat references (or else another California stake does the same thing, which is plausible). I love it. It’s beautiful, its very well done, and there are concerts every day. It’s open to the community, and from when I’ve been, it looks like there are lots of people from outside the stake who visit. It feels so very seasonally appropriate and worshipful. Our stake has has a carol concert in December for a few years now. a Christmas eve carol service has been held in our ward building some years, and not others ad hoc since we’ve been here. Last year was a not. This year there will be one. Apparently the program will be approved tonight, so I’ll find out later this week whether my daughter and I will playing our trumpets. We actually had a pretty cool ward party this year. In addition to the usual setup in the gym, the food was good and a clever little skit was put on in which Cindy Lou Who visits the Grinch on the Christmas following the one in the book, tells him what Christmas is all about, gives him a Book of Mormon, and introduces him to the missionaries. We had a number of non-member friends and family present, and a good time was had by all, even me. Our ward party was incredibly well done using the “A Night in Bethlehem” theme. There were tents with food and craft exhibits all around, a fake well, and an area for blankets for families to either eat or watch the nativity play that was put on. It was a lot of work, but really well done. Some real talent. The only miss is that it would have been a great opportunity to open to other faiths or bring others, but I’m not sure we had that as our main focus. In the past, we’ve hosted families from a local interfaith charity we work with called Family Promise that houses homeless families temporarily. We didn’t get that chance this year as I believe another congregation had their turn. Various stake activities in different years. We’ve done the creche thing a few times, and we’ve put on musical plays to which the public is invited–the Savior of the World, and one about the women in the life of Christ. Also live nativity scenes. We used to do magnificent lighting displays before the church asked that we not do that. Different families would volunteer to handle different sections, so it didn’t always look as pulled-together as at temple square, but the local newspaper would always publish a color picture above the fold, so it was great publicity. Oh, one aspect of doing a live nativity or play–guys in the stake are growing out beards all fall. Each ward I’ve lived in has something of a tradition, from musical events to firesides to parties to caroling. Some elaborate, some simple. My current ward always has a RS Christmas dinner, a ward party/dinner/program and service events. We always provide Christmas for all the residents of a care facility in town. The kids also do a number of things, last week they went to Temple Square, etc. They also have a couple of service events this month. I live in Utah County, too. There really are lots of non-strip-mall non-Mormon churches if you look around. 🙂 Fellowship Bible is less than a mile from my house in Lindon. Others that I drive by frequently in the American Fork–Provo area are St. Francis of Assisi, Victory Baptist, Rock Church, Provo Bible, St Mary’s Episcopal, In Life Church, Community United, AF Presbyterian, Provo First Baptist, Seventh-day Adventist, Lords Church, Foursquare (can’t remember the rest of the name), there’s also at least one Jehovah’s Witnesses hall. Orem Community has been around for decades. They always (used to?) put on a great living nativity which, incidentally was one reason at least some nearby wards decided not to do one, no one wanted to step on toes. Style of music is probably thornier though. Growing up, in my ward the junior school/primary children always did a Christmas nativity dramatisation during sacrament meeting in the chapel. The building had the pulpit to one side, piano and organ to the other, and tiered choir seating in between. The choir pews would be removed for nativity, leaving the perfect arena for it in the chapel. It was also great for ward and stake choirs. Sadly, that pulpit and choir was ripped out a few years ago as non-standard, and during stake conference the choir are now seated behind the stake officers, with the choir director having to stand on a box! And the nativity performances in sacrament meeting seem to have become a thing of the past. Our stake does a Messiah sing-a-long every other year. This is the off-year. Last year, we had an orchestra with about 30 people, including like 12 violins, 5 celli and 2 bass viols. Including the choir, orchestra, and attendees, there were about 2000 people, all doing the Hallelujah Chorus. Best attended so far. So tired, but so worth it! Looking forward to next year!